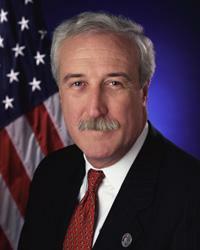 Image left: NASA's 10th Administrator Sean O'Keefe. Nominated by President George W. Bush and confirmed by the United States Senate, Sean O'Keefe was appointed by the President as the 10th Administrator of the National Aeronautics and Space Administration on December 21, 2001, his fourth Presidential appointment. As Administrator, O'Keefe led the NASA team and managed its resources as NASA seeks to advance exploration and discovery in aeronautics and space technologies. Sean O'Keefe earned his Bachelor of Arts in 1977 from Loyola University in New Orleans, Louisiana, and his Master of Public Administration degree in 1978 from The Maxwell School. His wife Laura and children Lindsey, Jonathan and Kevin, reside in northern Virginia.